In this article we will learn the most important feature of Java 9 – “Java 9 Modules“. We will cover everything like why we need modules, what is a module, how to create and use Modules in Java. Lets get started. Java Module System is a long overdue feature of Java. Module system is a part of Project Jigsaw, which was initially planned to release in Java SE 7 but got delayed and postponed to release in Java SE 8, yet again because it was a huge and prestigious project, it had been deferred from the Java SE 8 release and finally released in Java SE 9. In the following section I’m explaining from basics so that everyone can understand the need of modules. You may find it a huge wall of text but I assure you that if you read it carefully, you will be able to understand the reason and idea behind Modules. Why we need Module in Java? The most important feature of java is reusability, it allows us to reuse the classes that we have created with the help of inheritance and interfaces. We can inherit behaviour of a class with the help of inheritance and can inherit the abstraction using interfaces. To reuse these classes efficiently java has grouped them in packages and it is done in such a way so that similar type of classes are in a single package. For e.g. when we are working on collections, most of the classes and interfaces that we need are in java.util package. Over time as our code size increased, the packages in java also got increased. Imagine working on a very large program using hundreds of packages, in such case it is very difficult to understand which classes is using what. Packages are great way of organizing classes but there needs to be way to organize packages when we need to use several of them in our code. Also, the only way to make a class reusable between packages is to make it public and when we make it public it can be used by anyone. This needed to be addressed as well. Java 9 introduced a cool new feature to solve the issues that we discussed above. It introduced a new feature called “Module”. “A module is a set of packages”. A module not only organizes packages, it also takes care of the accessibility so that the part of the module that we want to be reused, can be used and the part that we don’t want to be reused, cant be reused. Till now we discussed everything theoretically, lets discuss modules with the help of codes and diagrams. What is Java 9 Module? A module is a set of packages. We have two types of packages in a module – 1) Exported packages 2) Concealed packages. Exported Packages: These packages are intended to be used outside of the module, which means any program residing in any other module can use these packages. 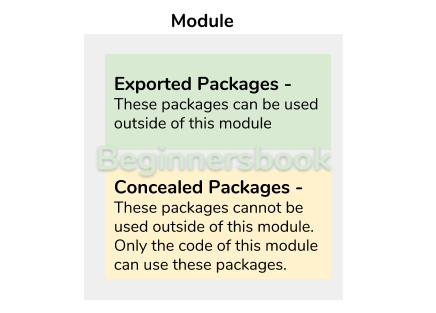 Concealed Packages: These packages are not intended to be used outside, they are internal to the module and can be used inside the module only. 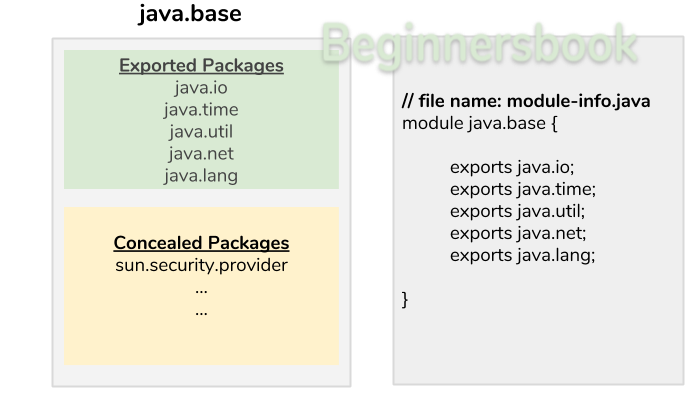 To further understand the concept of exported packages and concealed packages, lets take an example of “java.base” module. Lets understand this with the help of following diagram. In the following diagram, the green block in java.base represents “exported packages”, there are several number of exported packages but I have mentioned only few of them. These packages mentioned in the green block can be used by outside class. The packages in the yellow block are concealed packages, they are not accessible outside the module. These packages are meant to be used only inside the module. In java we define the module in module-info.java file and to mention any package as exported packages we mention the name of package after exports keyword as shown in the right side(grey) block in the diagram below. Lets write programs in Eclipse IDE and use the concept of Module. We will create a class in one module and use that class in another module. 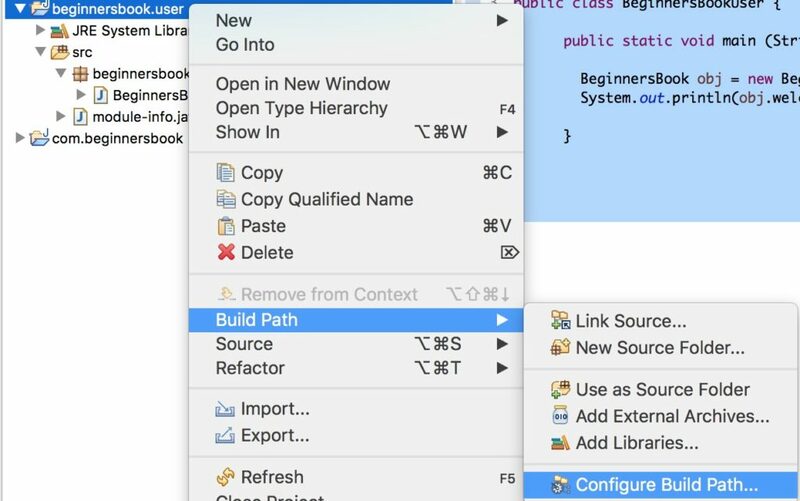 We are creating a java project in Eclipse IDE. The project name we are using is “beginnersbook.demo”. 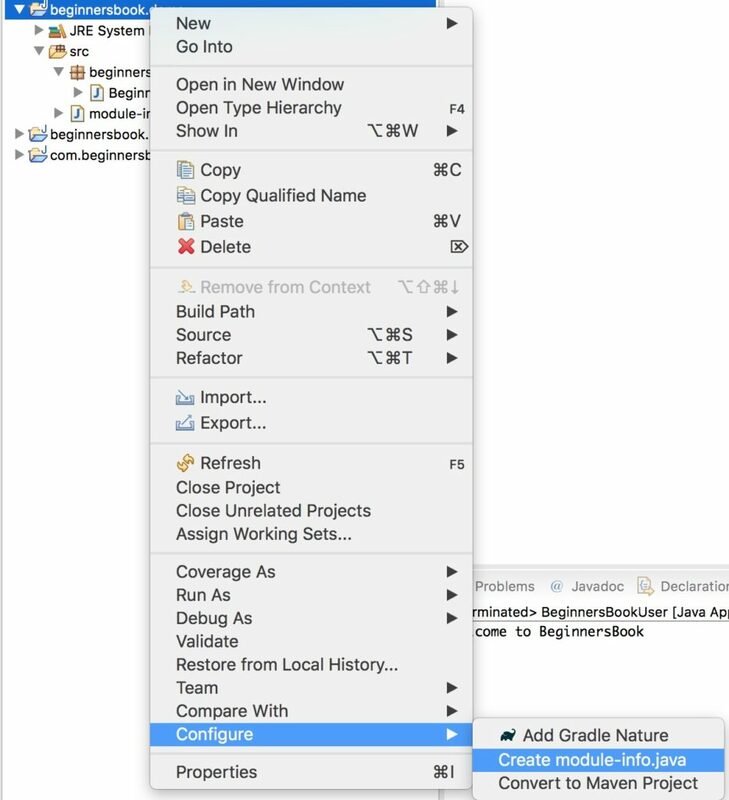 Once the project is created, right click on the project name, go to the “Configure” option and click “create module-info.java” option as shown in the following screenshot. 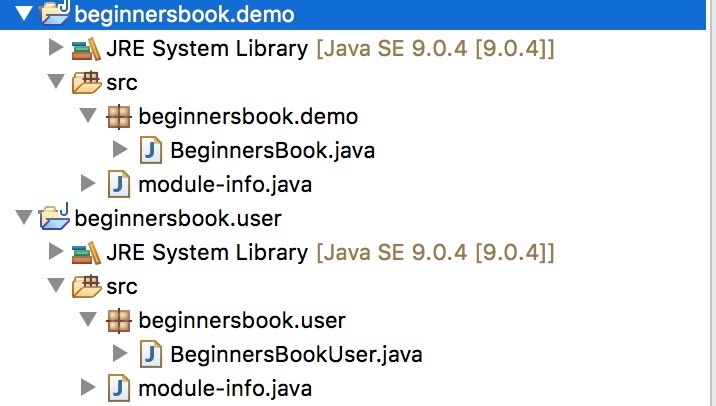 Give the module name same as project name “beginnersbook.demo“. For now leave the file empty. We will come to it later. We are creating a class in this module and we will use this class in another module. We are creating a class “BeginnersBook” in the package “beginnersbook.demo“. Since we are planning to use the beginnersbook.demo package, we mention the package name after requires keyword as shown in the above code. Your error should be resolved now. Create a class “BeginnersBookUser” in this project under package “beginnersbook.user“. Thats it guys. To give a brief, we have created a class in a module and exported the package so that the class can be used outside the module. To test it, we have created another class in a different module and used the exported package and finally used that class that we have created first.